Haslemere Chiropractic Clinic is feeling very proud of the colourful display in the front border of their West Street Clinic this year! Stocked with a variety of bee friendly plants such as salvia and lavender, and perennials such as geraniums, phlox and penstemons to add sustainable planting, it is looking great this year. We aim to provide a little oasis for wildlife in the centre of town, but also hope that our efforts in the front border give a little pleasure to passers by. We certainly get lots of comments! Caring about well being and health is an important part of our philosophy at Haslemere Chiropractic Clinic. We are also passionate about being part of the local community, and contribute in a number of ways such as collecting for the Food Bank and choosing a local charity to fund raise for each year. We are also committed to being as environmentally friendly as possible with a robust recycling policy ranging from the purchase of environmentally friendly products whenever possible (we love our biodegradable bin liners! ), a nesting box for House Sparrows on our side wall, and a pot of fresh mint in the garden for the Team to enjoy fresh mint infusions. 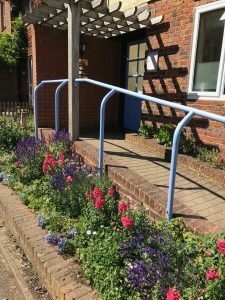 Creating a vibrant garden, then picking flowers to bring a bit of nature into the Clinic in an environmentally friendly way is another part of this environmentally responsible philosophy. Plants in our borders are chosen to provide colour and opportunities for picked flowers, but also for their credentials for supporting wildlife. In the front, one of our favourite plants is the vibrant blue salvia which in the peak of summer is a magnet for bees. We also love the lavender which is incorporated into our front border and up the driveway, and all the healing properties that are associated with this beautiful plant. The buddliea in our side border, known as the “Butterfly Bush” due to it’s ability to draw these visitors in, is yet to bloom but within the next few weeks this too will be playing it’s part for Haslemere’s insect life. So, if you are walking down West Street, please come and take a look at our front border display (opposite Waitrose). It is very good for all of us to have a mindful moment in our day when we pause and enjoy something in nature for a moment – the look, the texture, the smell – see what you can notice that you might normally pass by without a thought. Our flowers are intended to be a gift to local wildlife and to the wonderful community of Haslemere who have supported the Chiropractic Clinic for the last 21 years. Please come and enjoy!